The oldest form of jewellery made and worn in India, the Kundan Keshri style is considered to have origins in the majestic Royal courts of Gujarat and Rajasthan, before flourishing under royal patronage during the Mughal era. It remains an integral part of the bridal wedding trousseau. 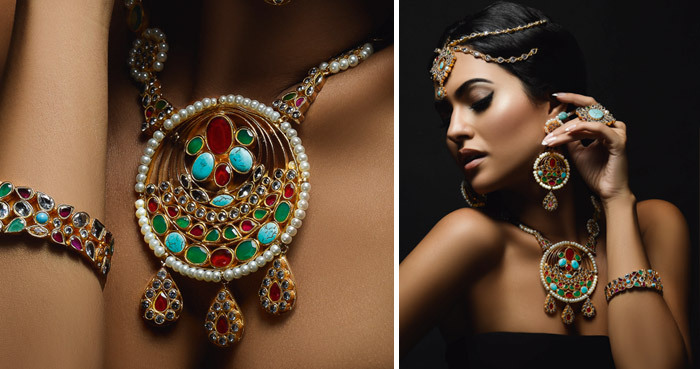 A gem is set with gold foil between the stones and mount with the technique typically seen on elaborate necklaces, as you might remember from the iconic scenes in Jodhaa Akbar. Ideal for brides who want regality to reign for their wedding day outfit, popular options remain a heritage set comprised of an ornate necklace, earrings and bangles, though for all-out impact, adorn with a nose ring, or Nath. Translated from the ancient Sanskrit term, Navratan means ‘nine gems’ and has important cultural significance in Hinduism, Buddishm and Sikhism, recognised as sacred across Asia, from Thailand to Sri Lanka. Navratna ornaments can be worn by anyone, regardless of religious beliefs. Heavy cosmic symbolism is at work in this style, with stones representing the natural flow of nature. Popularised in the classic Bollywood film Mughal-e-Azam, the various colours used allows Navratna to be worn with a spectrum of bridalwear. Bold shapes take centre stage when it comes to tribal jewellery, taking inspiration from the adornments once worn by our ancestors in the deserts of Rajasthan and Gujarat. This style of jewellery works well for brides who can carry off the look with confidence - Bollywood screen Queens Vidya Balan, Sonam Kapoor and Kajol are huge fans. Typically constructed with bronze, gold or silver and semi-precious stones, tribal jewellery is adorned with motifs from the natural world, such as lotus flowers and peacocks to make a strong statement. Pair with a glamorous sari or eveningwear. Polki is a variation of a girl’s best friend, a diamond that finds its origins in India. Very few people are aware of the word Polki, which is an uncut natural diamond, finding high demand in international markets. Jewellery made from Polki gives a touch of traditional flavour, it is treated with great honour and makes a beautiful heirloom pieces to pass down the family line. Polki symbolises love, emotion and memories making it ideal for your special day. Worn for highly traditional and formal functions; daring brides can also opt to wear a Polki set as a statement piece for post-wedding dinners. 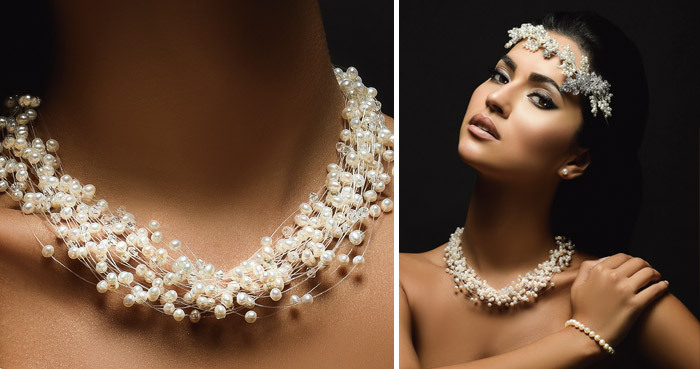 Perfectly smooth with an iridescent glow, pearls are synonymous with rare, refined beauty and make wonderful accessories for a registry bride or for an elegant reception look. The most valuable pearls occur naturally in the wild, and its their purity and simplicity that makes them a timeless classic for brides the world over. They say a rose by any other name would smell just as sweet and it’s fair to say that it’s also true of the American Diamond. Less valuable than a true diamond, the stone also known as cubic zirconia, is used as a less expensive alternative to precious stones. This doesn’t diminish its beauty in the slightest - it’s one of the bestselling styles of jewellery for brides who want a contemporary, elegant look for their registry or reception event.